I know in my last blog I promised to do a couple exploit ones instead of doing boring Web stuff. But, this level was really easy and I still wanted to do a writeup, so you're just going to have to wait a little while longer for my 'kappa' writeup! I immediately installed the 'httparty' gem and started writing a solution in ruby, when I had an inspiration. I tried using the same action multiple times, and it worked! It would only work for a few minutes before I had to refresh and get a new one. But, that was enough! Then I used Burp Suite's built-in list of passwords to attack the account. I let the attack run through the ~1000 or so passwords, then added a filter for 'Hello, ' (in order to find good attempts). There weren't any. Damnit, now I need a new plan! ...then, on a random inspiration, I tried an invert search for 'Wrong password'. And there was one entry: a password containing a single quote returned "An error occurred" instead of "Wrong password". *facepalm*, it's sql injection! And immediately, I'm logged in... as 'test'. Derp! And boom! I'm logged in as 'admin'! Finished, right? WRONG! The banner says: "Hello, admin!! My password is the flag!" Now, it sounds like I need to recover admin's password. CHALLENGE. ACCEPTED. Nice writeup! So I am able to follow up until you pass the POST request to Burp Intruder. How do you set your variables $1 and $2 to those values? This is the only part I am confused on. 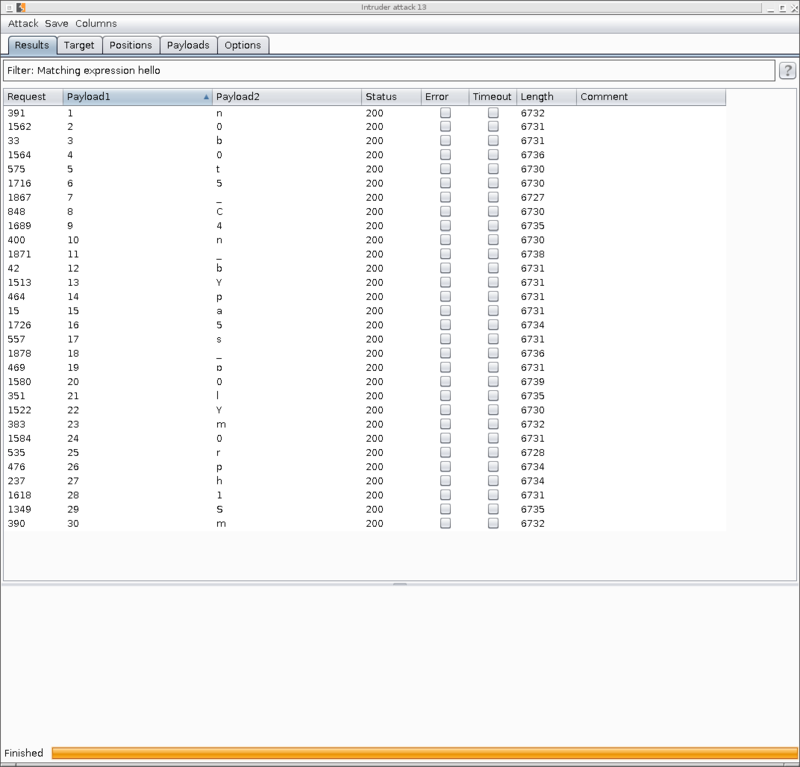 @Josh - In Burp Suite, right-click on a request and 'send to Intruder'. Then flip over to that window, and make sure you're on the 'Positions' tab, then hit 'clear §'. Highlight the first value (the username) and click "add §", then highlight the second value and do the same thing. Then, both values will be highlighted, and they'll show up in the 'Payloads' tab under 'Payload set'.